With the high end A6000 and entry-level A5000 models already in the range, the introduction of the mid-tier A5100 Sony has completed the transition and updating of the old mirrorless NEX models to the new Alpha series. It features a similar 24-Mpix back-illuminated APS-C CMOS sensor with gapless micro-lenses and on-chip PD-AF covering 92% of the image frame paired with the firm’s Bionz X level image processor. In addition to handling the data from the hybrid AF system, which comprises of 25-contrast detect and 179 phase-detect points, the processor contributes to the 6 fps burst capability (complete with AF tracking) and the ISO 25,600 maximum sensitivity. It’s also responsible for the cameras video-capture capabilities. Like its high-end sibling the A5100 offers 1080/60/24p video with the pro-level XAVC S codec, which provides bit rates of 50Mbps – significantly higher (and potentially far superior quality) than other recording formats used by earlier models including the A6000. Other attractive features include zebra pattern and manual focus peaking plus it has a flip-out rear 3-in touchscreen LCD, which the A6000 also lacks. The Sony Alpha A5100 measures 2.63 x 1.19″ (66.7 x 30.2 mm) and weighs 4.09 oz (116 g). It is available now at $699 including the stabilized 16-50mm kit zoom. 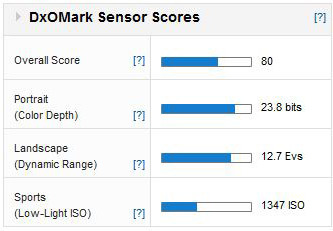 The A5100 sensor achieved a DxOMark sensor score of 80 points, a very good score for a 14-bit back-illuminated APS-C sensor and only two points behind the best of its type. Color sensitivity is excellent at 23.8 bits as is the sensor’s low light capabilities. While the 12.7 Ev dynamic range is good, however, it’s still only fairly typical for a modern APS-C size chip; even some of the best Micro Four Thirds sensors such as that found in the flagship Panasonic GH-4 and Olympus EM-1 come close, while even Sony’s 1-inch sensor in the Cyber-shot DSC RX10 is 12.6 Evs. 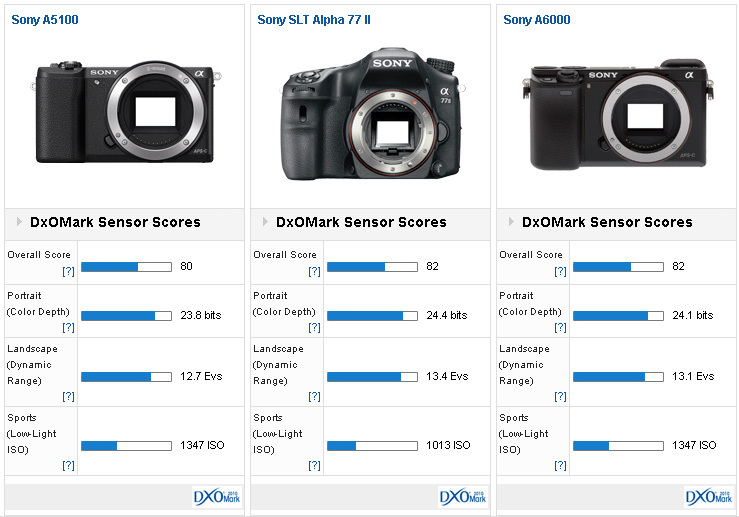 With a DxOMark score of 80 points, the A5100 comes extremely close to the company’s SLT Alpha 77 II and the current top-of-the-range A6000 model. Color depth is just behind both models in the labs though in reality the 0.6 bit difference between it and the Alpha A77 II equates to just -0.3 stop and just half that (-0.16 Ev) between the A6000. Dynamic range is also lower. The A77 II performs best here with a +2/3 Ev wider range while the A6000 has a not inconsequential +1/2 stop advantage. In low light however, the semi-silvered mirror of the SLT model accounts for the lower performance of the A77 II while the two mirrorless models are identical. On balance it looks as if all three share a related sensor. Compared to the $799 Olympus OM-D E-M10 (complete with 14-42mm kit lens) and the seriously small $750 Panasonic DMC-GM1, which use the smaller Micro For Thirds sensor, the A5100 looks very competitive. That’s not to say the smaller sensor models don’t perform well, as they do, particularly the E-M10 but the A5100 sensor is unquestionably a better performer. It has almost +2/3 stop improvement in color over the Olympus and nearly 1 stop advantage over the Panasonic. The rival E-M10 comes close in terms of dynamic range; it’s just 0.6 Ev narrower at base but the GM1’s sensor is noticeably -1 Ev less. Arguably the most revealing of all is the disparity in low light capabilities. 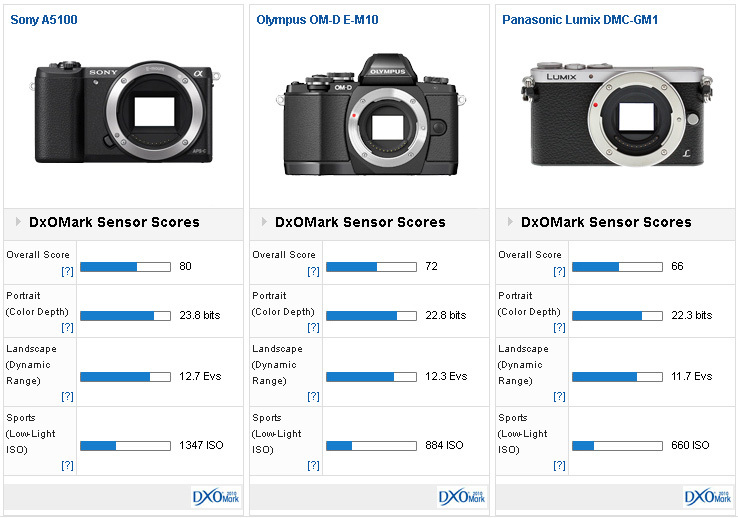 The Sony has close to +2/3 stop advantage over the Olympus and +1 stop over the Panasonic. With the introduction of the A5100 Sony appears to have undermined the higher-end A6000 model somewhat with its support for the pro-level XAVC S codec. 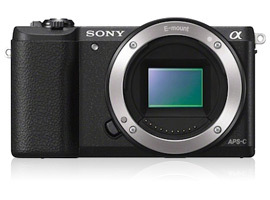 It’s not as if the A5100 adopts a lesser sensor either. In fact it appears to be the same unit with practically identical imaging performance (and identical AF functionality). Naturally some attractive features of the A6000 are missing, notably the EVF, higher continuous frame rate of up to 11fps and wireless flash control, but if those features aren’t high on your wants list then the A5100 looks like a tempting option.